The lifetime option pays the annuitant for the rest of their life. At death, if the annuitant hasn’t outlived life expectancy any remainder goes to the insurance company. In case of a joint annuity, both parties need to die before payments stop. The period certain option allows the annuity to be passed on to a survivor in the case of death before the payouts are completed. For example, the payments could be scheduled over a period of five, ten, fifteen, or twenty years and the appointed survivor will receive the benefits no matter what. Period certain plus lifetime guarantees the owner income for periods of usually 10, 15, or 20 years of scheduled payments. No matter when the annuitant dies the beneficiary continues to receive payments. Which is the best option? That depends on many different circumstances – but visiting with your financial planner is really the best option. They can help you make an informed decision. When you buy an immediate annuity you will have to choose the term of the annuity, which will determine how long your guaranteed income stream will last. A term certain annuity will have an income stream that lasts for a specific number of years, whereas a life annuity provides guaranteed income for as long as you are alive. With a fixed immediate annuity, the amount of income you receive each month will be a fixed amount. Monthly income will stay the same throughout the term of your annuity contract. 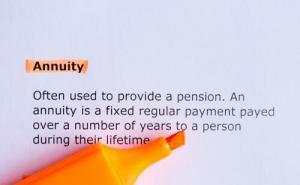 An inflation-indexed immediate annuity is a form of a fixed annuity. You receive a guaranteed stream of income from the insurance company, and that income will rise each year based a pre-determined formula; usually the increase is tied to changes in the Consumer Price Index. With a variable payout immediate annuity, the insurance company does not provide a guaranteed stream of income – instead the amount of income you receive will depend on the performance of a portfolio of underlying investments, usually stock and bond mutual funds. Thus your payment will vary each month, or reset once a year, depending on the way the annuity is structured. A significant issue to be aware of with any annuity is the cost and commission rates will vary depending on how your advisor is compensated. Commonly, there is the risk of a conflict of interest. As fiduciaries, Callahan Financial Planning does not receive, nor do our clients pay sales commissions to our firm. This is how we address a potential conflict of interest, and is commonly referred to as “Fee-Only” advice. A Certified Financial Planner must also render advice in a fiduciary capacity.